Mother’s Day may be over, but that just means there’s another parent to celebrate soon! Father’s Day this year is Sunday, June 17, so that gives you about a month to plan on what gift you’ll be giving dad. And let’s be honest, dads can sometimes get the short end of the stick when it comes to gifts—ties, socks, and cologne? There’s absolutely nothing exciting about those. But you know what dad would get super excited about? A Rolex! Make this Father’s Day your dad’s best one yet by gifting him a Rolex watch. We’ve even made it easier on you by rounding up our favorite Rolex watches to suit any type of dad. 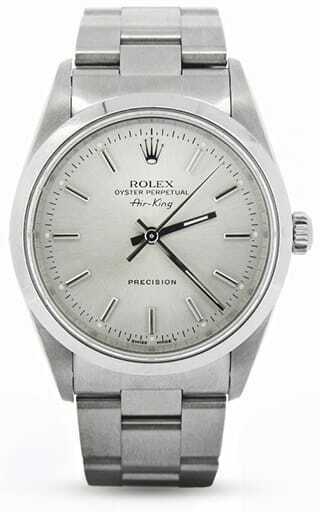 Plus, don’t forget, our collection of pre-owned Rolex watches are priced well below retail prices and we also offer easy financing options to make buying dad the best gift ever even easier. 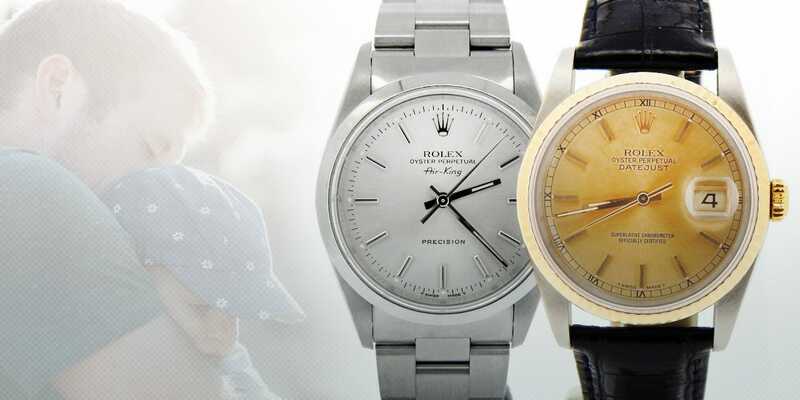 If your dad is a more laid back kinda guy, then a Rolex Air-King may just be what he wants. This low maintenance Rolex has everything he needs and nothing he doesn’t. The Air-King ref. 14000’s stainless steel construction can keep up with daily life, while the 34mm size of the Oyster case is discreet. The face of the watch is subtle too, featuring a monochromatic style with a silver dial, simple stick hour markers, luminescent center hands, and no date window. Unassuming thanks to its minimal design yet ultra dependable due to its robust and reliable automatic movement built by Rolex, any casual dad would love the Rolex Air-King as a Father’s Day gift. If your dad prefers a sportier style, then it’s got to be the most famous dive watch in the world for him—the Rolex Submariner. This particular model, the Rolex Submariner ref. 16610 is especially significant because it’s the last of the classic Subs. That is, it comes with a traditional aluminum bezel rather than the newer ceramic bezels. The black bezel and black dial combo is a timeless choice and like all modern Submariners, it comes with a sturdy 40mm Oyster case water resistant to 300 meters. So whether dad spends his days lounging poolside, hanging out at the golf club, or toiling away at the office running the show, the sporty Submariner will be his perfect companion. 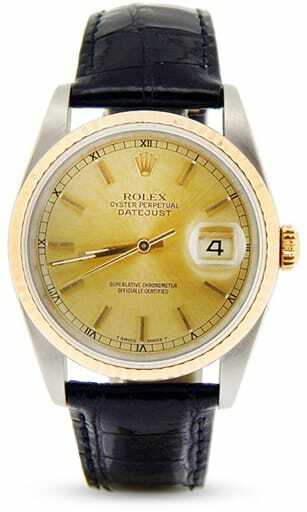 If your dad appreciates the classics and doesn’t care for trends, then a two-tone Rolex Datejust is right on the money. The combination of yellow gold and stainless steel is a signature combination for Rolex and the Datejust ref. 16013 is a fantastic example of the enduring appeal of a two tone Rolex. While this beauty hails from the 1980s, it’s remarkably similar to contemporary versions of the two tone Datejust 36. With its yellow gold fluted bezel sitting on the 36mm steel case to the yellow gold center links flanked by steel links on the legendary Jubilee bracelet to the attractive champagne dial with the famed date window, this is the definitive Rolex dress watch that would make just about any dad happy. If your father would fit right in with the cast of Mad Men, then a two-tone Rolex Datejust with a leather strap would complete his dapper style. Although this Datejust ref. 16233 was made in the 1990s, its marriage of yellow gold and steel on the 36mm case, classic champagne dial, and elegant black leather strap would be right at home circa 1960s as well. However, since it was manufactured in the 1990s, this Datejust does boast modern features such as scratch-resistant sapphire crystal protecting the dial and the practical quickset date function to permit the date to be set independently from the time. A handsome Rolex watch to match dapper dad’s pocket square, chic tie, and elegant leather shoes. If flash is what dad wants, flash is what dad will get. Put on some shades and bathe in the sparkle of this opulent platinum Rolex Day-Date with 35 (!) carats of gleaming diamonds! 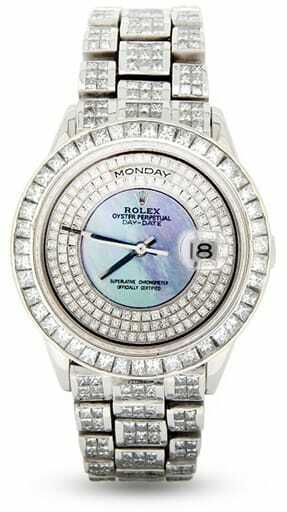 This 36mm Rolex President shines bright with diamonds everywhere. The blue mother-of-pearl dial is accented with three rows of princess-cut diamonds—leaving just enough room for the day indicator at 12 o’clock and the date display at 3 o’clock. The princess-cut diamonds continue onto the bezel and then shimmy on down to the famous President bracelet. 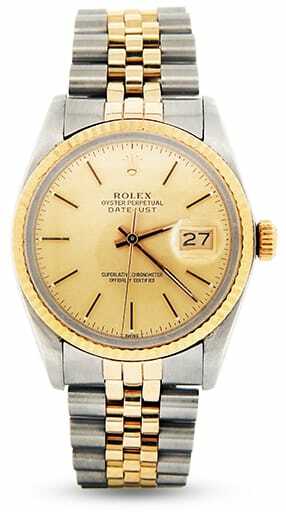 Weighing a hefty 223 grams, only the most confident of dads can pull off this supremely lavish Rolex watch. If you’re not quite sure how to tell dad how much you love and appreciate him this Father’s Day, these five precious letters will let him know without having to say a word: R-O-L-E-X.